NOTE: This content is old - Published: Friday, Dec 8th, 2017. 10pm We are wrapping up this update page after fifteen hours – thanks to you and the literal tens of thousands of people who have read this page today. A special thanks to all of you who have sent in pics / vids / tips / snippets of info via various means! 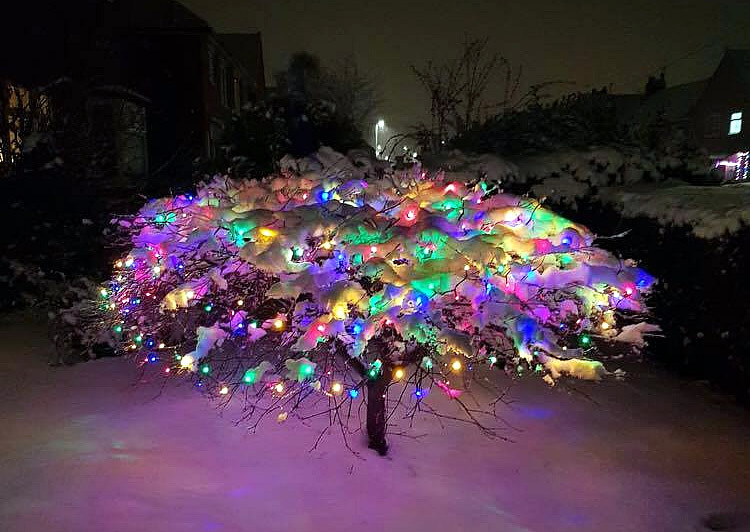 Stay safe overnight and through tomorrow if you venture out. 9:49pm Had several more black ice reports in, overnight temperatures are due to drop even further so if you are travelling tonight take care. Tomorrow morning is due to be 1C but feeling like -3C, with it due to stay cold all day. There could be some sleet and snow in the early morning, with the day then due to be clearer thereafter. 9:40pm Another dog in a coat enjoying the snow… this one even has dog wellies on! 8:31pm Thanks to Adam for sending us this dashcam clip from a crash earlier today in the Nant y Garth pass. 8pm The forecasty bits appear correct with things calming down – however what has fallen is freezing and is very crunchy underfoot. 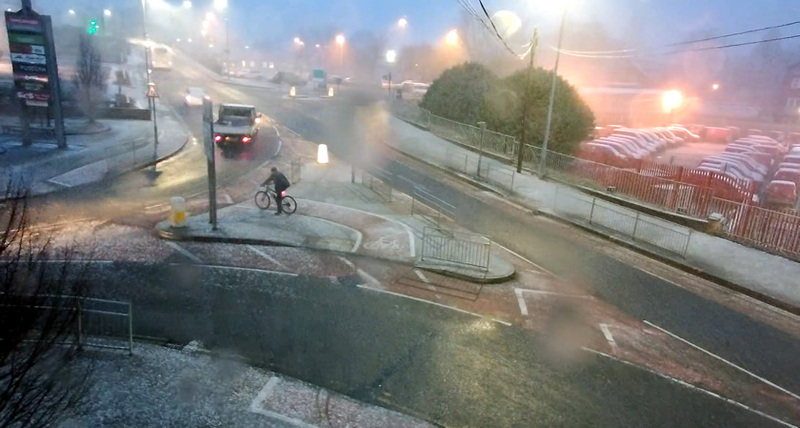 People are still struggling around in the slippery conditions, with the morning likely to be much worse. @wrexham cars struggling to get up link road hill by Y Tai Brymbo. 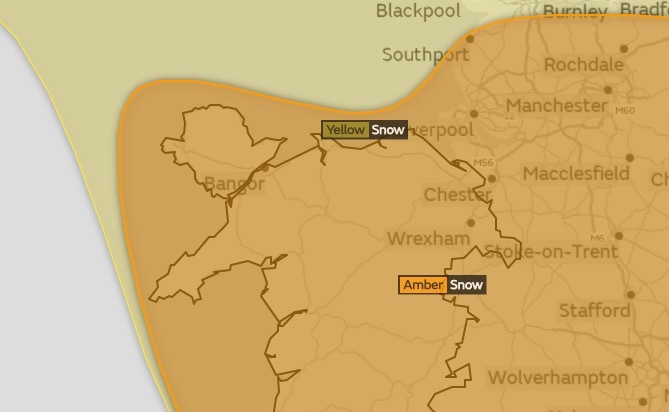 7:33pm Snow appears to have calmed down the for the rest of the night – however a lot more heading our way from the early hours of Sunday morning with an amber weather warning in place. Brr! 6:58pm Looking at the radar it appears that after the snow around 7:30pm-745pm we might dodge the rest that is coming in from the north! Then we are set for the odd flurry but nothing as serious as have seen today. The other news is temperatures are set to be 0C and feel like -4C with 25mph gusts floating about. 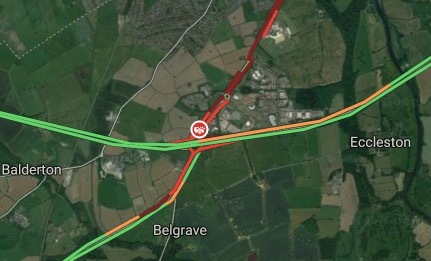 6pm Further to the reported incident at the Posthouse, one report says around five cars could be involved – with the incident taking place on the eastbound A55 and thus the knock on affecting surrounding roads and the junction. 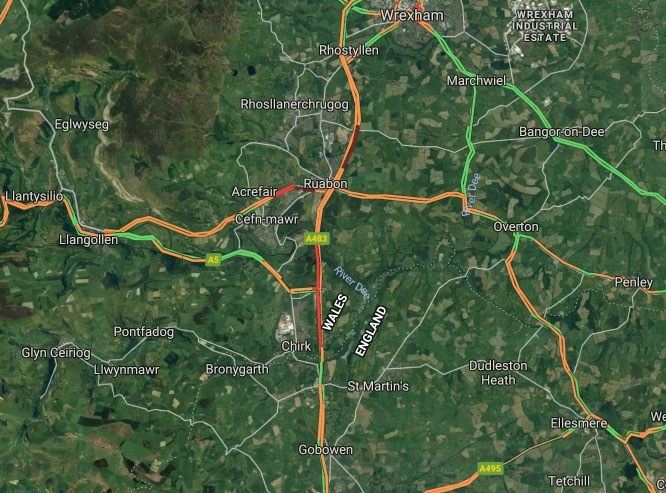 5:52pm ‘Standstill traffic’ by the Posthouse roundabout at the top end of the A483 – appears a collision has taken place, with varying descriptions of what has occurred so far. 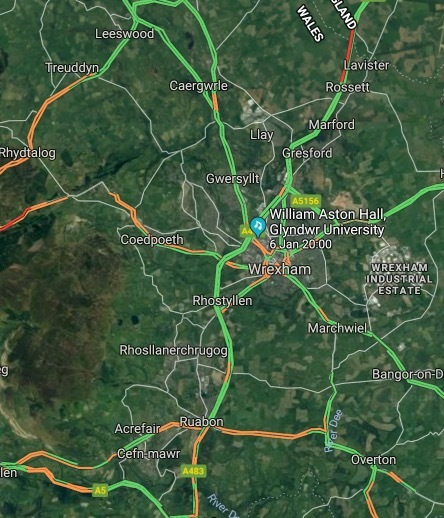 5:46pm Anyone heading east on the A534 there are two bad bits of traffic by Clutton and by Bickerton – Tom has told us there is an incident involving a HGV near to Nantwich with the road blocked. 4:53pm A few asking on buses – this is the last update from Arriva earlier – and common question is if No1 Wrexham to from Chester is running, and it is. 4:20pm Sunset was around fifteen minutes ago and we are heading into the normal rush hour period – lots of exclamation marks and red warning signs on various monitoring systems, but all reporting slow traffic rather than incidents thankfully. 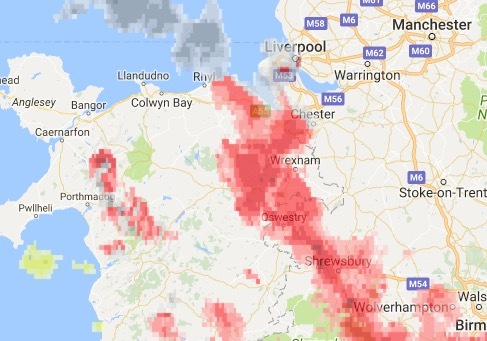 4:05pm Snow in the higher parts of Wrexham has been particularly bad today. 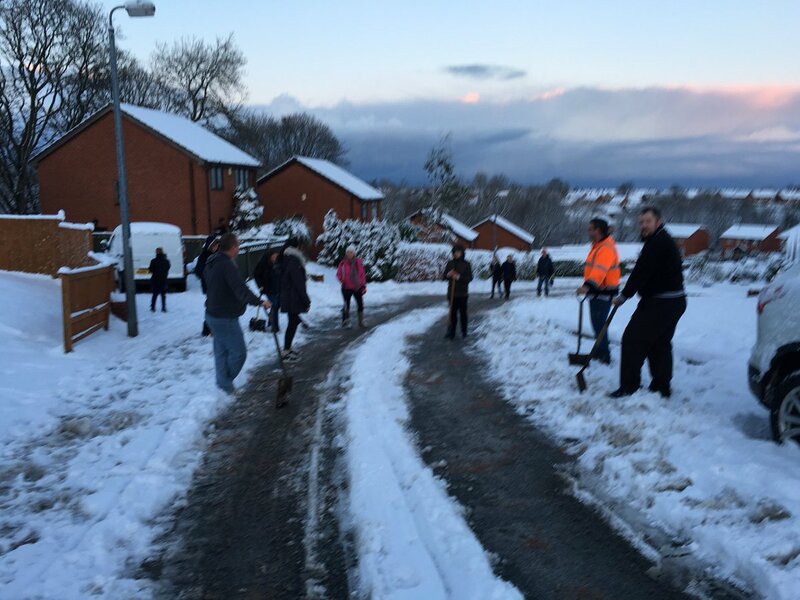 Just been tweeted this pic by Caitlin of “community spirit” and people clearing the roads in Penycae. 4pm Leaving work soon? 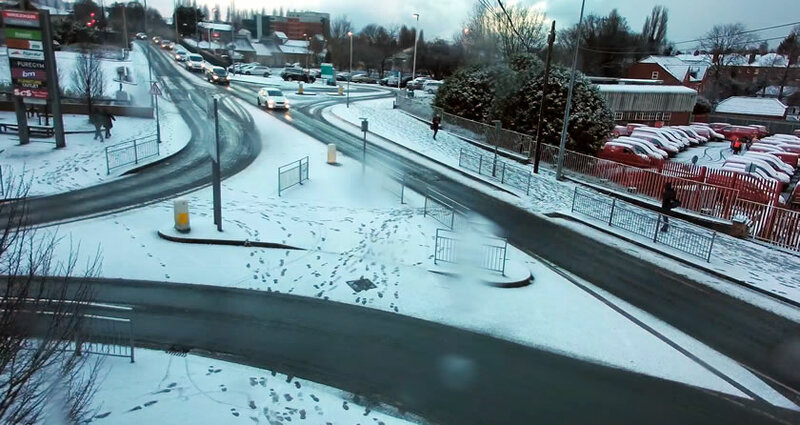 Aside from some traffic on the A483 northbound at Rossett and usual town centre traffic, roads are looking fairly clear at the moment. Spot any issues? Email them to news@wrexham.com or tweet @wrexham! 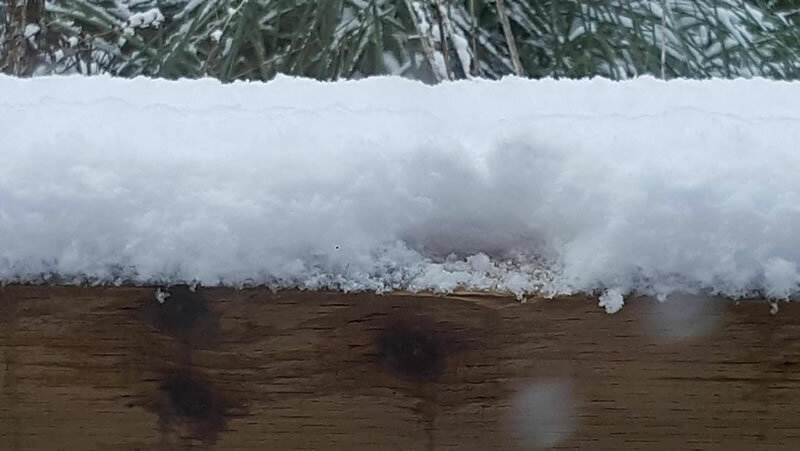 2:30pm We have our first snow measurement! 2:23pm 54 schools across Wrexham are now closed, so there are lots of students enjoying an early weekend and a snow day. Quite a few out and about sledging and making snowmen! 2pm Still great news that there has been no serious incidents reported in the Wrexham area due to the weather. Looking at the radars there is on and off snowfall right through to early evening – with more predicted later on. 1:25pm We have had an email pointing out that town centre snow clearing has been mentioned, offering this historical insight: “Back in the 1950s and early 1950s council workmen cleared areas such as Hope Street, Regent Street, Hight St and Henblas St with shovels and loaded the snow onto Bedford open backed tipper lorries. The loads of snow were transported down to the Gwenfro valley where it was deposited into the river. “In Brook Street the snow was shovelled into the river through an opening in the road opposite the old Victoria Hall (Scotts). Workmen lifted the cover in the roadway and placed a safety fence around the ‘drop’ into to the river. The cover is still visible in the roadway today. Any other snow related history, pop it to the usual email address! 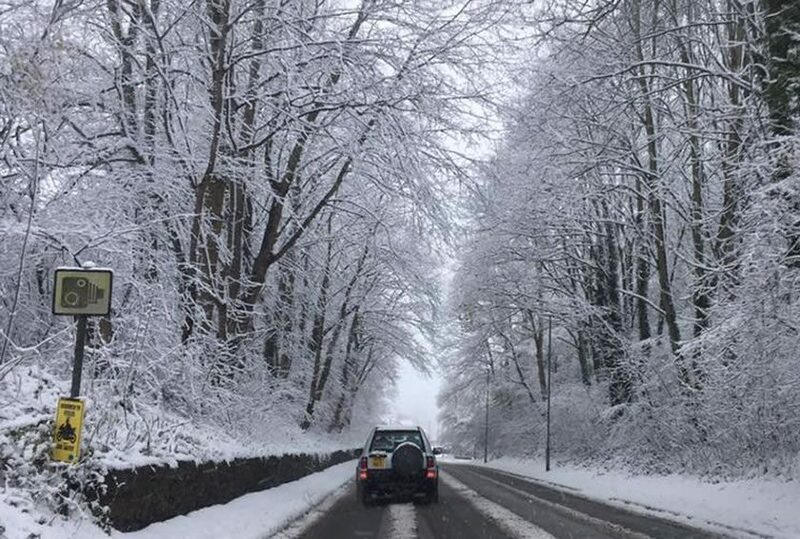 1:15pm Lovely picture of the road up Acrefair – thanks to Tamara for sharing this one. 1:03pm Feeling cold? 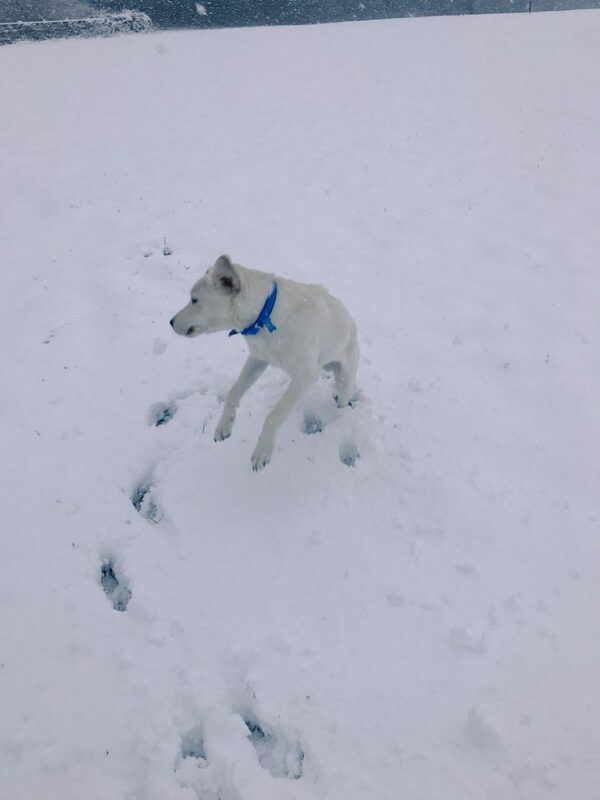 This will warm you right up… Clare has shared this video of her pup enjoying snow for the first time! 12:58pm Wrexham Libraries have said due to the adverse weather conditions Cefn Mawr, Coedpoeth, Chirk, Rhos, Ruabon and Overton libraries will be closed all day. 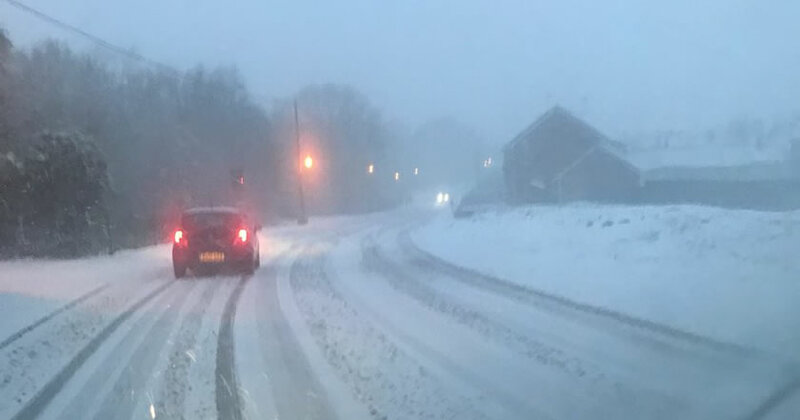 12:45pm North Wales Police have said “Our Control Room are experiencing a high level of calls due to the adverse weather – please bear with us and only phone 999 if absolutely necessary” adding that people should keep an eye on the police social media for updates. 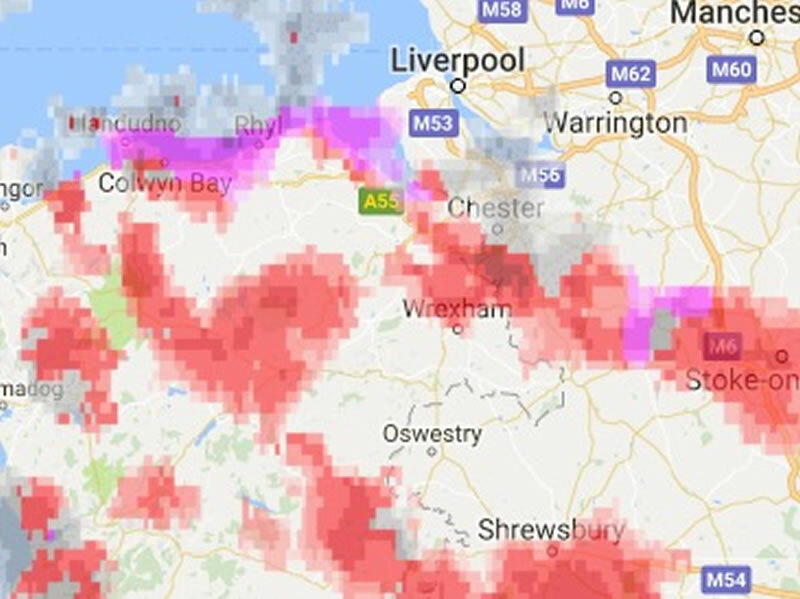 12:35pm Looking into this afternoon the radar images suggest the higher areas to the east of the town will have more heavy snow, with a band passing over the town centre for around 45 minutes from just after 1pm, with more later. 12:15pm Number ticked up to 49 schools now closed or partially closed within Wrexham County Borough. 12:06pm Coleg Cambria have updated further so any students living in Wrexham but studying in Deeside or Northop, be aware all their sites are now closed to students. 11:42am As is now tradition, the Secondhand Shed at the top of Pen-y-Bryn has some sledges in stock. So you can walk up and buy one then slide back down the hill! 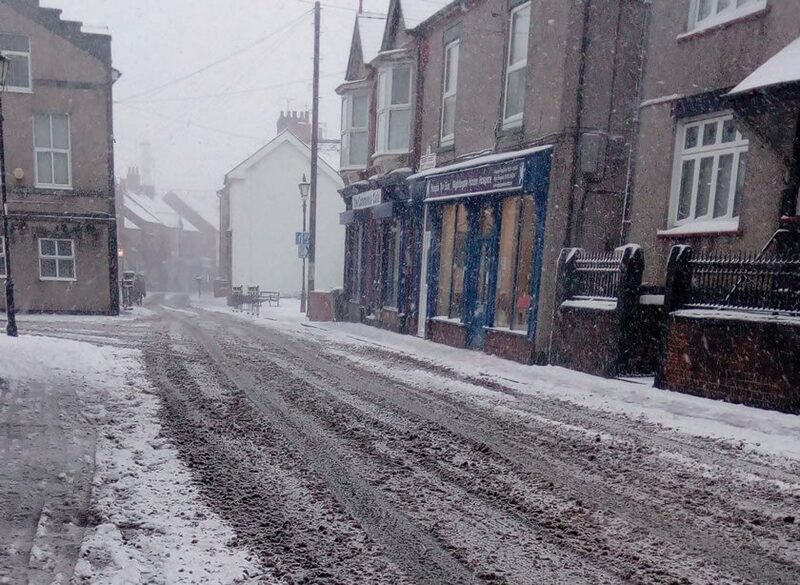 11:37am Just as we popped that gritting update on, Alison from Rhos sent us this picture of Market Street, pondering how long it will be before no one can get up there as cars are skidding while trying to get up Gutter Hill and passengers are walking off buses. 11:30am This is fairly typical of non-main roads that are a little higher up. 11:25am We are out having a nose around town, and Llwyn Isaf is looking very pretty in the snow. 11:02am The Ponderosa Cafe has shared this picture on the Facebook page, showing the conditions up on the Horseshoe Pass. That road is unsurprisingly closed…! 10:56am For those in town, business as near usual! 10:53am A great snowman picture, with some PPE of course! 10:49am Official now from Coleg Cambria who have told us “We are closing our Yale, Bersham Road and Llysfasi sites at 11am today because of the weather”. 10:44am Not going to pretend we are weather people, but the radar shows we are due to get some thick stuff now then more in about an hour! 10:32am Told that Coleg Cambria in town is sending students home and is effectively closed. 10:25am Another school closure, Brynteg CP is asking parents to pick their children up when they can. They also say “don’t panic we will keep your child in school until you are able to collect them”. 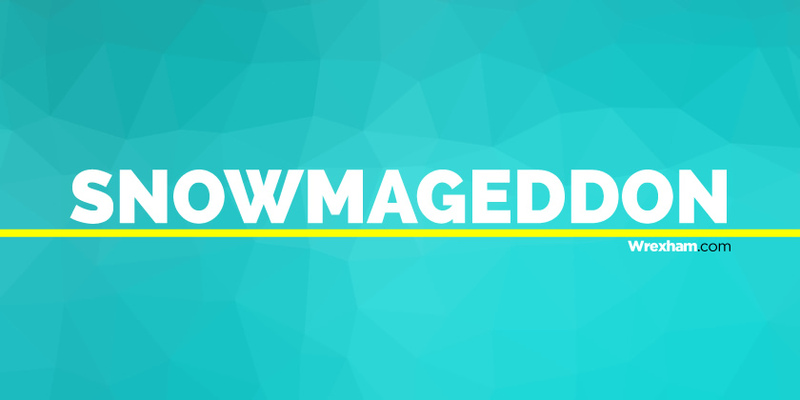 9:55am Three more schools closed Penygelli , Hafod in Johnstown and St Chads – with the others monitoring conditions. Total of 24 schools closed / partially closed so far this morning before 10am. 9:40am No more schools have declared closures, with those open now monitoring conditions. Thankfully aside from a couple of minor bumps there does not seem to have been any serious incidents this morning due to the snowfall. 9:32am The wait time at the Maelor is ‘over four hours’ with 46 people queuing. Usually with poor weather demand rises, and the message usually is to choose carefully. 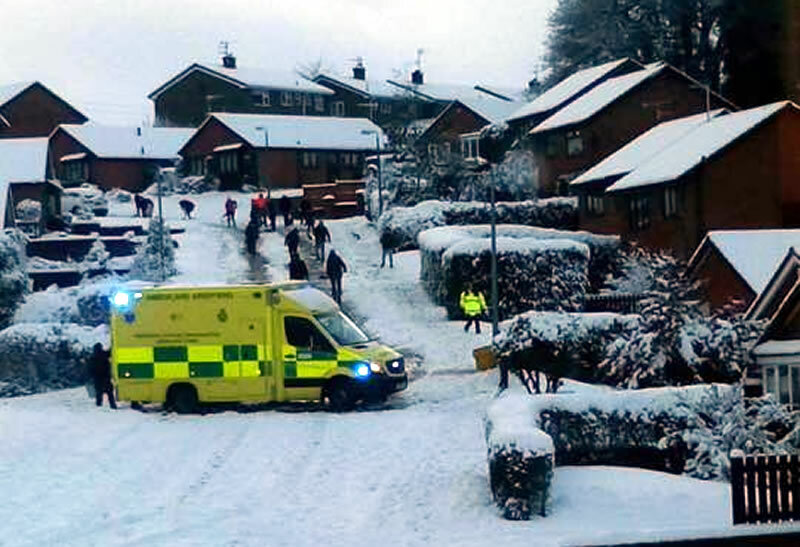 Take care if out and about over the next few days so you are not another number in that line. 9:25am Looking ahead there is a spot of rain / sleet through the morning but then more snow this afternoon. Tonight temperatures will go below zero, meaning a freeze of whats left with more snow due tomorrow on top so be aware. 9:19am Cefn Mawr CP, Min y Ddol, I.D. Hooson in Rhos all join the closed school list. Many of the others staying open are advising parents to keep an eye out for updates. 9:12am Ash has pointed us to his tweet and vid, with conditions in the Moss being like Siberia. 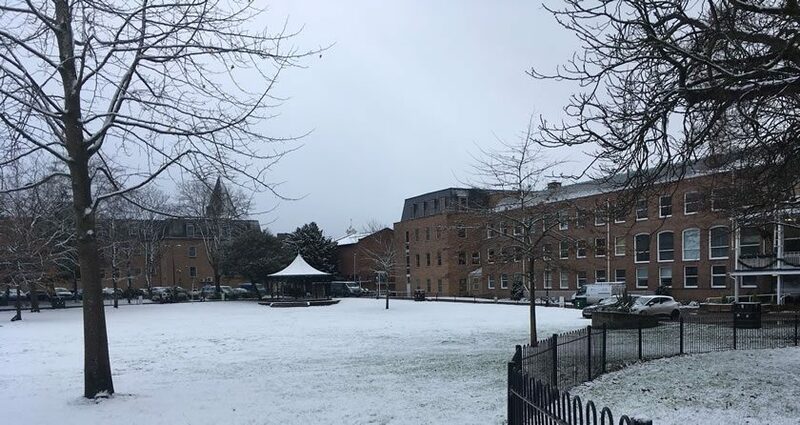 9:10am With a few flakes causing SNOWMAGEDDON CHAOS this morning, Scott has sent us this ace pic of the town’s Christmas tree on Queens Square being even more festive with a dusting of actual proper snow. Beautiful! 9:08am Arriva buses / trains both have not reported any service interruptions or issues so far that we can spot. Barker’s Lane CP and Bwlchgwyn join the schools closed list. To see how the conditions have changed this is the view of Regent Street looking towards Mold Road / football ground direction. We posted a picture at 8:15am from this view as well if you want to compare below. 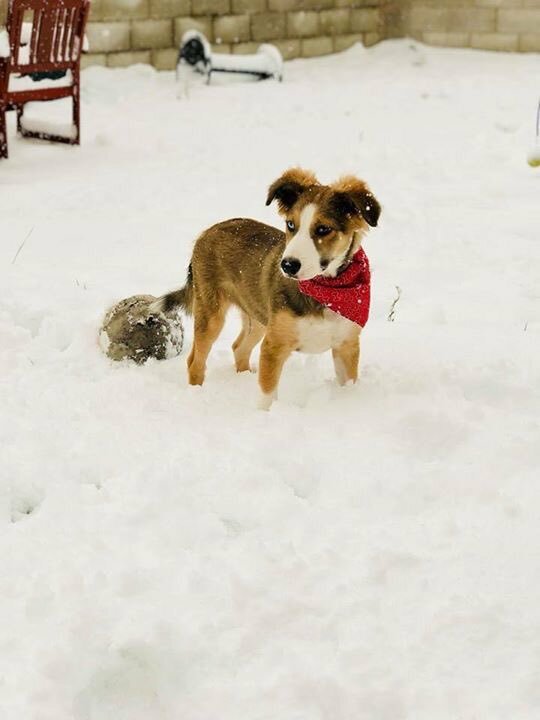 Jack has sent us this picture from Cefn Mawr – brr! 8:39am Minera has said the school is closed, adding “Please collect any children from school asap”. 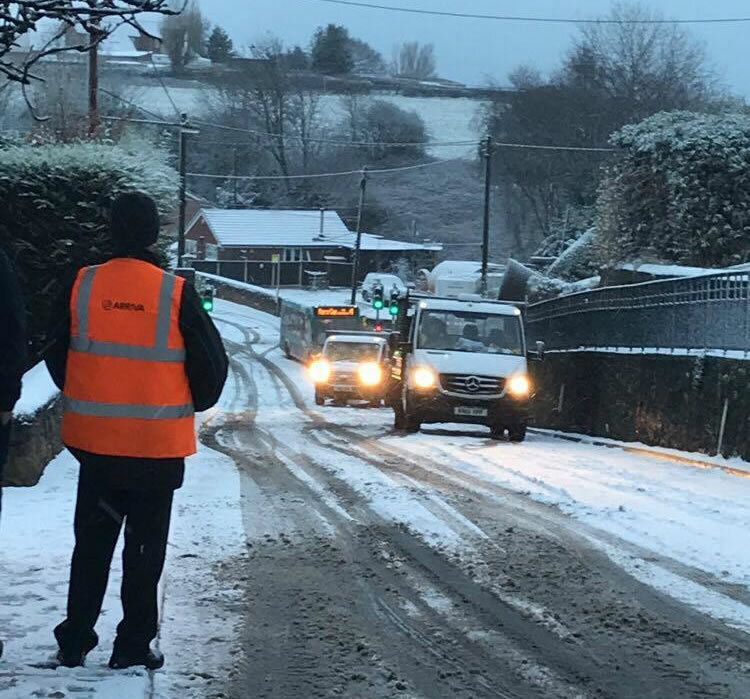 8:34 St Mary’s in Brymbo are also closed today “Sorry but the school will not be open today due to staff not being able to get to school.” That is seven so far closed today. 8:29am St Josephs High School have said they are closed ‘due to the recent heavy snow’ . A yellow weather warning for snow has been in place since just after midnight with temperatures just about struggling to stay above freezing overnight. 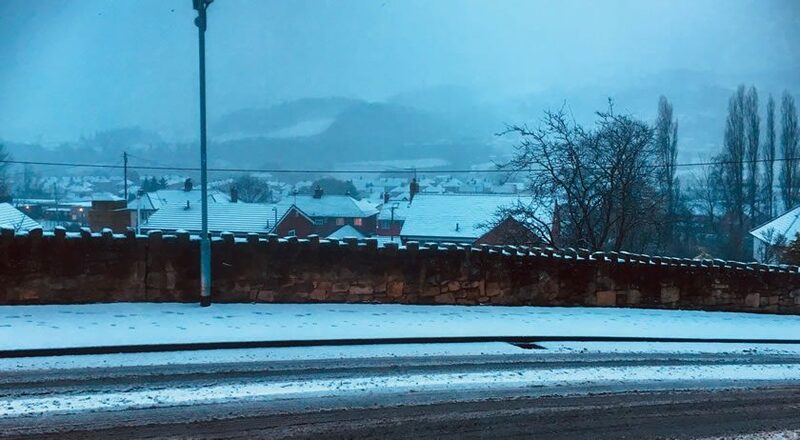 The forecast had predicted heavy snow from 3am on, with it continuing on and off through to the afternoon with a freeze this evening as temperatures dip under zero. 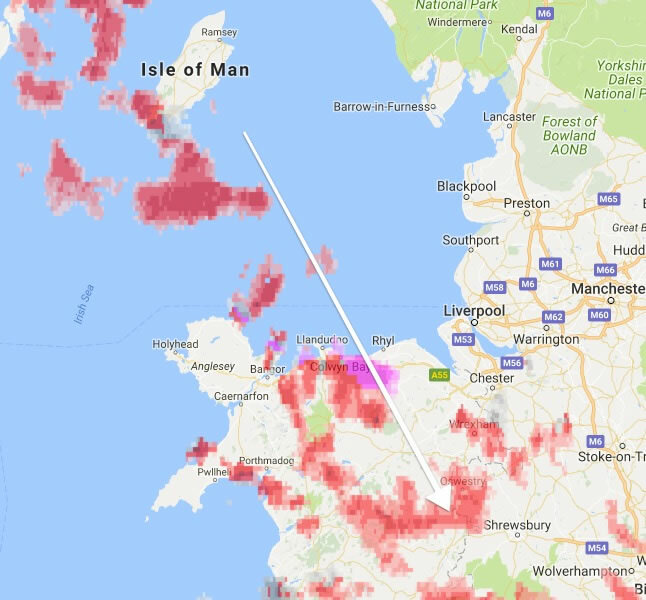 Some promised snow has arrived – and here is a quick selection of some tweets we have been sent already and we are trying to get further detail on what impact the light flurries have had so far this morning – if any. In March 2013 Wrexham had its last proper snowfall with schools closed, bus services were stopped and many a snow man was built – thankfully today does not seem to be lining up to anything near that, but if you are keen to relive the shivvers… you can see the Friday and Saturday articles on the links! 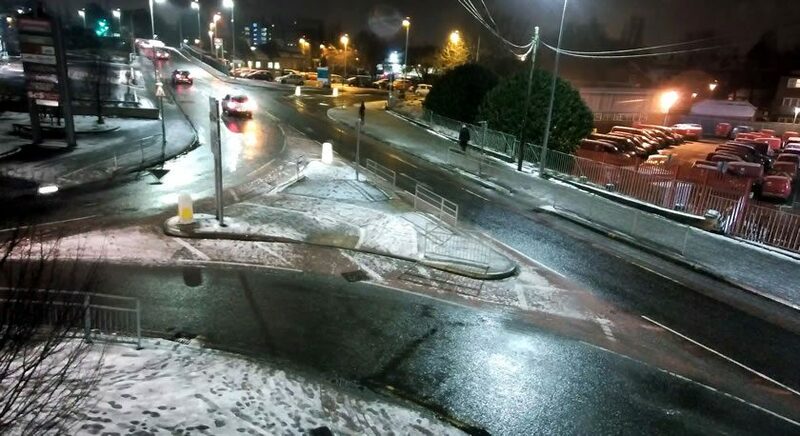 We will be updating this page with Wrexham Snow Updates – please email us on news@wrexham.com , tweet/DM @wrexham or post on the forums with updates and we will collate them on here! Read 1,246,206 times in last 30 days. RT @meganmatthias Anyone know of any Women’s Rugby Union teams in or around @wrexham? Y Fenter C.P.I. | The Venture I.C.C. View all of our recent tweets by clicking here...! Read 1,246,206 times in last 30 days, and 73,800,636 times since we started in 2011. *Stats independent & directly measured by Google, via the Analytics Live API.